In 2014 UFACTORY built the first open source desktop robotic arm, ushering in a new era of affordable desktop robotic arms for consumers. uArm is an Arduino-powered desktop 4-axis parallel-mechanism robot, easy to use, has multiple accessories and open sourced. In Jan 2014, uArm went on Kickstarter and became famous overnight, leading to an exclusive interview with WIRED. A standout quote from the piece: “Thirty years ago Bill Gates promised to put a computer on every desk in America, an ambitious sentiment echoed by Wang and company … The most innovative aspect of the entire project is probably the concept of putting a robot arm on your desk”. As the robot arm is moving to various industries, its users have expanded from relatively minority geeks to robot lovers. The demand for better and easier user experience is increasing. January 23, 2017, UFACTORY returns again, announcing two robotic arms in uArm Swift Series. Swift is intended to highlight the elegant texture of the fuselage, lightweight and portable form and flexible movement, just like a swift. This series has uArm Swift and uArm Swift Pro. uArm Swift enhanced the control algorithm and increased the accuracy by 50%, from 1cm to 5mm. uArm Swift Pro adapted self-designed reducer. Working with a high-precision stepping motor, uArm Swift Pro minimizes gear gap, improves joint accuracy, and is more compact. The built-in 12-bit magnetic encoder and motor forms instant position feedback, achieving closed-loop control, and improves the accuracy to unprecedented 0.2mm, perfectly performs 3D printing and laser engraving. uArm Swift Series improves mechanical arm structure and increases working range by 20%, covering the working area of an entire A4 paper. uArm Swift Series upgrades the main board. We choose Arduino MEGA 2560, which is nearly 10 times larger in the storage space compared to the previous UNO edition. uArm Swift Series has 4-axis, whether equipped with fixtures or suction head, the end of uArm can freely steer, and the replacement of accessories requires less than 30 seconds. uArm Swift/uArm Swift Pro have a built-in socket for selected Seeed Grove modules. uArm Swift Series can be equipped with a smart car, the uCar. uCar is a mobile open-source car, with infrared avoidance, trajectory planning functions. uArm Swift Series adapts CNC integral forming process, and the whole body is matte black. uArm Swift looks has a more minimalistic design. The aluminum body is light and stable, enhancing the overall rigidity. Compared with the previous version, uArm Swift series redesigned the base, inserted the mainboard and added power button, function switching button, play button and menu button. The new indicator light shows the current operation mode and status of uArm Swift. uArm Swift Series support PC + mobile control. 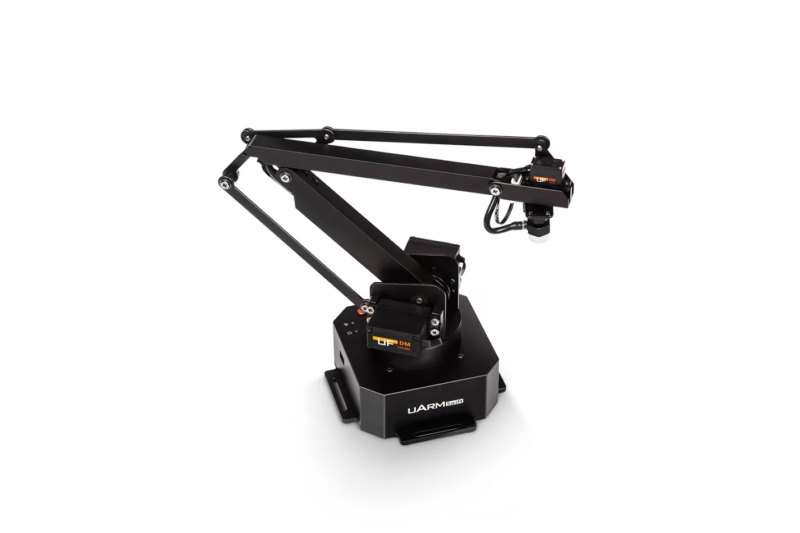 uArm Studio is a brand new cross-platform robotic arm control software. It has integrated offline learning, graphical programming and instant control functions, manipulate the robotic arm to finish complex tasks. Teach uArm Swift by your own hand to learn move, gripping, dropping, and save them with just a click to replay on Blockly mode. uArm Swift can also sync offline learning data once connected. 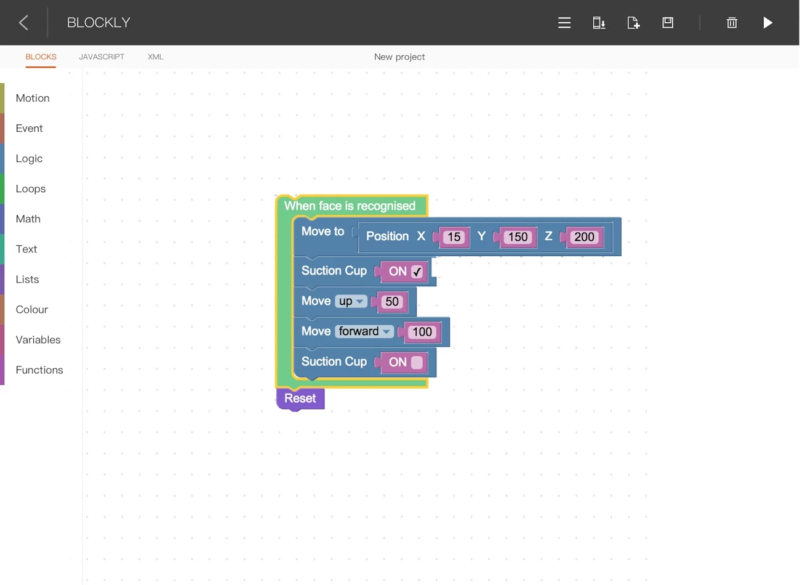 Blockly is a web-based visual programming tool, allowing users to program without needing to code The software is designed to be so simple that even even preschool children could create a program easily. Detailed tutorial will be provided for your quick guide and interesting secondary development. uArm Studio has combined control of keyboard and mouse. Developers may use keyboard hotkeys and mouse simultaneously to control move, gripping, and dropping of the robotic arm, and it supports customize hot keys. After connect with LeapMotion, users of uArm Swift may use their own hand to control gesture such as move, gripping and dropping etc. Robotic Arm has built-in Bluetooth module, simply connect your smartphone with uArm Play to remote control your uArm Swift or uArm Swift Pro. Your smartphone can also work as an external actuator, download and run a program from Blockly. UCS, also known as uArm Creator Studio, which is a open sourced developer tool developed by UFACTORY. UCS has integrated graphical programming and coding, to achieve features such as rapid development, visualize and easy sharing. With numerous commands of UCS, developers don’t need to construct programming environment. For programming developers, UCS is a rapid development tool, developers doesn’t need to construct programming environment, any interface of the whole system supports Python script, all variables can be sharing between visual programming and coding which means you don’t need to copy setting each time. UCS has integrated complex robotic vision function, just need to connect with the camera, so the uArm can “see” and adapt to different environment. The camera can instantly locate, memorize, recognize and track 3D space position of objects. Every creator will be able to save their own work as .task file format through the UCS programming, and it supports one click sharing to the official website of UFACTORY or Reddit Community, copying scenario in just one click on other robotic arms. 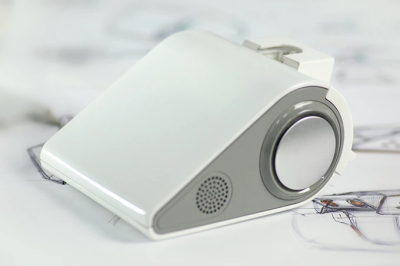 The uArm Swift Pro is a “Open Sourced” design concept with more freedom, simplicity, and functions. This is a whole new open platform came from developers, back to developers, and still that Open Source Robotic Arm. We just can’t wait to become your comprehensive desktop assistant! The Mystery of Robot Planet is an 8bit inspired adventure-puzzle game for Windows, OS X and Linux scheduled for release in 2018. Visually inspired by early Pokemon games and mechanically based on other adventure-puzzle games such as Monkey Island and Beneath a Steel Sky, the game follows the player character, Ivan, on his quest to become a Marine and save the Princess! With many vibrant locations, planets and separate endings depending on choices made throughout the game, The Mystery of Robot Planet aims to be a fun, unique and immersive experience for those who crave the puzzle-solving goodness of the early 90s point and click adventure games. Vienna, Austria, Sept. 20, 2016 — The Vienna-based hardware startup Robo Wunderkind, which develops modular programmable robots for young children, announced today a $500,000 funding round with participation from Arkley VC as lead investor, business angel Juergen Habichler, and the Austrian Federal Promotional Bank (AWS). The funding will go into the widening of their retail reach and the expansion into new markets. The plan is to build a worldwide distribution system and to give young customers from everywhere a chance to learn coding and robotics in a fun and simple way. 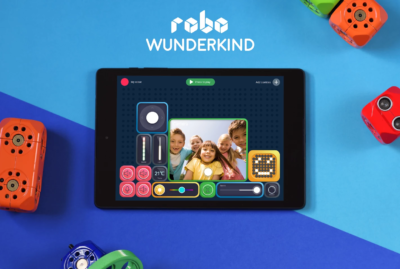 The startup already raised $250,000 from backers from 58 countries on Kickstarter in October 2015 and by now collaborated with more than 50 schools around the globe to bring Robo Wunderkind to the classroom. Its vision is to revolutionize the way children interact with technologies through developing educational hardware and software products. Today, the startup is also announcing its new application to remote control electronic devices: the Robo Play App. Its simple programming interface will allow users to easily create personalized virtual dashboards to control the robots they will build with Robo Wunderkind modules, remotely via Bluetooth or Wifi. In the next step, the team is going to make the Robo Play App compatible with other Internet of Things (IoT) devices, such as cameras, lights, motion and light sensors. 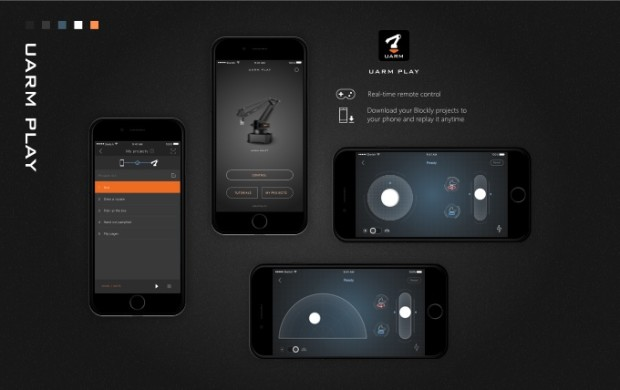 Robo Play App is free and will work on both Android and iOS devices. It will be compatible with all Robo Wunderkind kits, which are already available for pre-orders on their website with shipping planned for later this year. Robo Wunderkind was founded by Rustem Akishbekov, who brought Anna Iarotska and Yuri Levin on board in 2013. The company is based in Vienna, Austria, and maintains an office in Shenzhen, China. In the last three years, the founders have gathered a team of passionate engineers and designers dedicated to the vision of making coding and robotics accessible to everyone. Their first product is an educational robot that syncs with intuitive mobile applications to help children understand the basics of programming. Robo Wunderkind was part of the world’s first and largest hardware accelerator HAX in 2014 and Finalist of TechCrunch Disrupt SF Startup Battlefield in 2015. It’s no secret how exciting the trend of makerspaces are for schools. While this movement was started quite some time ago, it seems to have gained particularly great momentum in the past 5 years. Built on the idea of ‘constructionism’, makerspaces are a very obviously translated idea, where a space is dedicated within a school or educational facility for students to create and ‘make’ things. There is shared resources and networking that takes place and provides a different structure of learning for students. Ranging from woodworks to robotics, these spaces are extremely important in fostering creativity and problem solving in students. Where Will Makerspaces Work Best? Makerspaces also range from elementary schools to college campuses, so their versatility is extremely useful. It’s places like these that encourage a different type of learning to take place, perhaps a more ‘open-range’ type of environment that differs from the structure of a classroom being led by a teacher. Some supplies for a makerspace are less available than others, such as 3D printers and robots. If you compare sharing a robot amongst a class of 20 students to them all sharing a computer to learn from; you can see how the essence of learning is diluted. The experience is completely different and likely not nearly as effective or beneficial to the students until it’s their “turn” to use the computer. The same can be said for robotics. We know they are extremely useful for teaching many STEM concepts and early mechanical engineering, and LEGO robots are very popular for schools and competitions but start around $400. For most public schools, one robot may be more than is affordable so to effectively teach an entire class by sharing; the students are not receiving the best quality experience from their class. Here is another example where the Virtual Robotics Toolkit can provide a solution to hundreds of schools and thousands of students, where each student is able to individually use the simulator. They can build and control their own robots using the exact same controller and concepts as the physical robots. In fact, if they’ve already learned how to use a LEGO EV3 MINDSTORMS or NXT robot, they will seamlessly navigate the VRT. Pilots use flight simulators to learn to fly for the same reason students can learn robotics with one; costs and training purposes. If students are given access to the VRT in addition to the makerspace of sharing a physical robot, their skills and overall experience will be greatly enhanced and at a fraction of the cost of a real robot. It’s a win-win for teachers as well, since they’re able to help their class all get to the same level. Where can this movement take students and educators? This is such a great point, because of global networking the opportunities are truly endless. Again, here is a great window of opportunity for the VRT to be a part of your school’s makerspace. The software already encourages users to interact and even compete with other robot enthusiasts across the globe via the internet. This capability allows students to learn from eachother and share ideas and challenges that they would otherwise not have had the access to. Gemini, a waterdrop-shaped, two-wheel, self-balancing robot with two distinct personalities, will accommodate consumers’ leisure needs more than ever before. The Gemini Kickstarter campaign launches on November 10th, 2015. 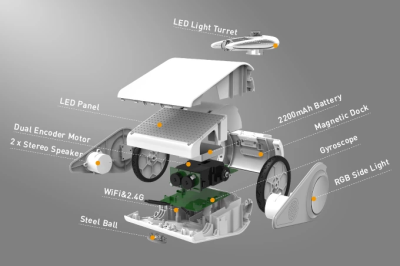 After the wild success of Makeblock, an educational robot kit series targeting makers and educators, the Shenzhen-based hardware startup Shenzhen Maker Works Technology Co., Ltd expanded its reach and designed the user-friendly smart robot Gemini, which requires no programming knowledge or assembling efforts on users’ behalf. 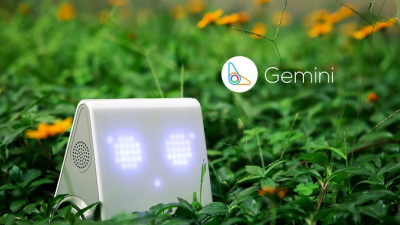 While standing, Gemini moves like a cute puppy, spreading joy via iridescent LED lights and flashing emoticons, and dancing to music at your command. When Gemini is equipped with a turret and crouches down, however, the robot transforms into a fearless warrior who is ready to combat. The key to Gemini’s accurate signaling and angular actions lies in the self-balancing technology. With one MPU-6050 3-Axis Accelerometer and Gyro working with STM32 MCU, through real-time analysis of related state parameters, Gemini can minimize the displacement both vertically and horizontally, in a timely manner, and control the angular offset with the utmost accuracy, remaining level with ease. The waterdrop-shaped, two-wheel, streamlined structure, empowered by the dual encoder motors with high resolution, ensures Gemini’s extraordinary agility and mobility. Based on the free iPad app, the robot can perform complex motions and tasks with tap-and-swipe finger movements, tilting techniques (gravity control), and voice control. Together, the 2.4G and Wi-Fi modules offer seamless and timely communication, instantly transmitting and updating all parties’ data throughout the game. Inheriting the signature Makeblock blue LED lighting, Gemini improves the transmission efficiency and undermines unstable performance from the reflection of the sun, which is often encountered by IR light-enabled devices. Overall, Gemini offers users an enhanced interactive experience. Starting at USD $99.00, the team provides different bundles for buyers. “Our mission is to make an ‘Apple product’ for consumer robot kits,” says the founder and robot hobbyist Jasen Wang. 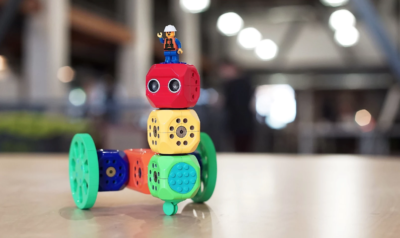 PHIRO: A LEGO® compatible robot for all kids. Learn to Code in 5 ways. Robotix has many years of experience teaching coding and robotics to several K-12 schools. They have evaluated educational robots from all over the world and found gaps. The robots are usually expensive, use proprietary programming languages and are not so fun for kids. Robotix has created Phiro, an affordable robotics & coding toy that helps kids learn to code and develop computational thinking skills. Kids can learn to code in 5 ways, either without a computer or with open-source programming languages that millions of kids use and love. 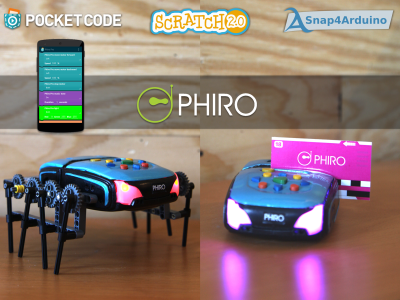 Phiro is a LEGO® compatible robotics toy that kids can play, code & innovate with to develop 21st century skills. “In today’s technology-driven and rapidly changing world, being computational thinkers to solve problems is an essential skill for children to learn. Computational thinking is a critical 21st century skill that is relevant to all fields from economics, sports, medicine, law, and engineering. Research shows that one of the most effective ways for kids, as young as 4, to learn computational thinking is through coding and robotics”- said Deepti Suchindran, PhD, CEO, Robotix USA. “With Phiro children get to see the practical application of programmes they have created instantaneously”- said Dr. Wolfgang Slany, Professor of Computer Science & Head of the Institute for Software Technology, Graz University of Technology, Austria. With Phiro, kids can play music, make a movie, create games, flash lights, detect faces and much more. Coding and playing with Phiro empowers and inspires kids to be creators and innovators of tomorrow. Robotix has created two robots: Phiro Unplugged & Phiro Pro. Both robots come fully assembled and are ready to learn from & play with, right out of the box. Phiro Unplugged for kids ages 4 to 8. Kids can learn to code & program the robot without a computer! 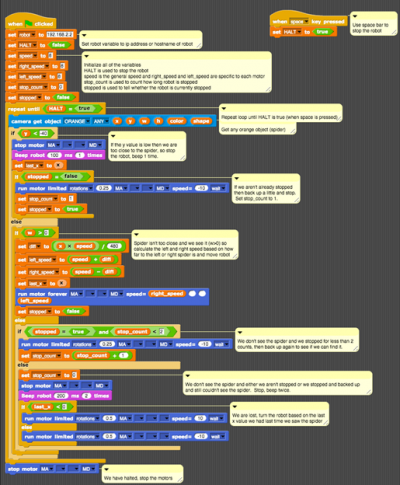 Phiro Unplugged is a great robotic tool to learn Sequential programming and Binary Coding. Phiro Pro for young people ages 9 to 18. Kids can program Phiro Pro with a computer, tablet or smartphone connected wirelessly via Bluetooth to Scratch 2.0 (MIT, USA), Snap4Arduino (UC Berkeley/Citilab, Spain), Pocket Code mobile apps (Graz University of Technology, Austria). Learners can connect to a community on-line enabling collaboration, sharing & learning. Phiro Pro also has all the capabilities of Phiro Unplugged. “In one package Phiro does what a whole lot of other systems do individually so it really helps to bring all those together … and make it more cost effective for the classroom”- said Daniel Riles, Technology Integration Specialist, Brookwood School, Boston, USA. NEW YORK and WASHINGTON, Sept. 25, 2015 /PRNewswire/ — Today the LEGO Group announced the LEGO® MINDSTORMS® EV3 Programmer App, a new application that allows builders to create programs for MINDSTORMS robots directly from iOS and Android tablet devices. Featuring a streamlined selection of the most-used commands, the EV3 Programmer App allows for more interaction away from the desktop or laptop computer, giving users even more freedom to explore and tinker with the MINDSTORMS platform. The EV3 Programmer App will be available in free versions for iOS and Android tablets in English, German, French, Dutch, Spanish, Danish, Japanese, Chinese (Mandarin), Korean and Russian in late November 2015. The app is not a standalone experience, but designed for LEGO MINDSTORMS EV3, the LEGO construction set that allows you to build and program robots that do what you want them to do (U.S. SRP $349). The EV3 Programmer App consists of the 11 most popular programming blocks in the LEGO MINDSTORMS software, including action blocks, flow blocks and comment blocks. After writing and saving a program within the app, a user can progress to more advanced programming by opening it in the LEGO MINDSTORMS desktop software. To provide additional inspiration for beginner robot makers, the app will feature building missions, videos and building instructions for five starter robots that represent a variety of building and programming experiences all while delivering the fun factor for which LEGO building is known. To further inspire the next generation of innovators, the LEGO Group is showcasing the creativity and innovation of the MINDSTORMS Community at two high profile events this weekend, World Maker Faire, September 26-27, in New York, NY, and the Smithsonian Innovation Festival, September 26 – 27, in Washington, DC. At each event, MINDSTORMS makers will demonstrate inventions they’ve built using MINDSTORMS building sets as prototyping tools in addition to showcasing a variety of fun LEGO robots. At the Smithsonian Innovation Festival in Washington, DC, Shubham Banerjee, the 14-year-old founder of Braigo Labs will demonstrate his braille printer built entirely from LEGO MINDSTORMS and share his process of invention with attendees. Alongside Shubham, Cameron Kruse, Fulbright alumni and LEGO MINDSTORMS builder will demonstrate a prototype for his baseball mudder, a machine that can apply the same amount of mud to each new baseball, eliminating inconsistencies in the ways mud was applied to new baseballs before they were used in a game. Both Shubham and Cameron will participate in 15 minute Q&A interviews as part of the event as well. The EV3 Programmer App for tablets will be available through the App Store and Google Play in late November 2015. For more information on LEGO MINDSTORMS and examples of robots built using LEGO MINDSTORMS EV3, please visit www.LEGO.com/MINDSTORMS. RoboSnap currently works on the LEGO® Mindstorms EV3 as well as the Raspberry Pi with the BrickPi add-on board. Not only can RoboSnap add vision to your robot, it can be programmed with Snap!, a Scratch extension or with the Python and C programming languages. Shari says, “We provide many choices to program RoboSnap in order to support our youngest customers to our most experienced. We received a lot of positive feedback about the ability to program the EV3 with Snap! at our demonstrations at the San Mateo Maker Faire. Many kids are learning Scratch at school and it is comfortable for them to continue to program with this language as they move into robotics.” Kickstarter backers can select to receive the “JUST THE SOFTWARE” reward if they are interested in programming their robots with Snap! on the EV3. 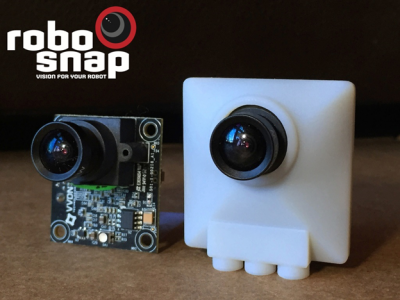 RoboSnap will be available exclusively on Kickstarter from May 13 to June 12, 2015 with the first shipments of RoboSnap cameras in October 2015. Information about SnapCAD just appeared on the VEX Robotics website. You can now sign up with your email to get informed as soon as SnapCAD is available for download. 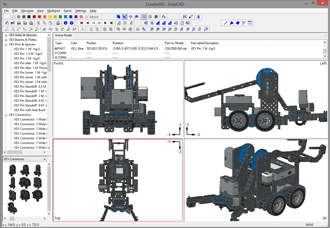 The SnapCAD vision began when some members of the VEX IQ community began converting VEX IQ CAD files into the popular open-source LDraw format. This made them available for use in a number of publicly available LDraw editors. Drawing from community expertise, SnapCAD is a new LDraw editor designed specifically for VEX IQ. 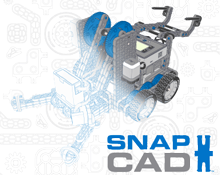 Students can use SnapCAD to learn the fundamentals of computer aided design (CAD) and create new VEX IQ robots!